History: (Strange Tales I#138/1) - As the Imperial Hydra prepared to conquer the United States using their Betatron Bomb, he summoned the Fox section chief and his executive staff to a meeting, told them that Operation: Doomsday was ready, and to send their staff to Washington to present their demands. Two members of Fox division journeyed to Washington and demanded the American government's surrender, under the threat of activating the Betatron Bomb. The Betatron Bomb was ultimately disarmed by Tony Stark, using the Brainosaur. HYDRA's Tiger and Rhino divisions are covered under their own entries. The Fox (Reynard Slinker) really should have been a member of HYDRA's Fox division, but he wasn't shown to have joined HYDRA until well after the Imperial Hydra's day. HYDRA's animal-themed divisions were only used during the Imperial Hydra's tenure. More's the pity! HYDRA's Beaver Division was responsible for engineering duties. No Beaver agents were ever identified. HYDRA's Camel Division was responsible for supplying duties. No Camel agents were ever identified. HYDRA's Falcon Division was responsible for air combat duties. No Falcon agents were ever identified. HYDRA's Leopard Division was responsible for reconnaissance duties. No Leopard agents were ever identified. 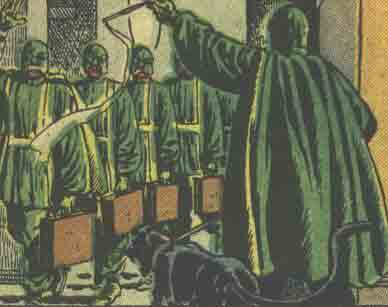 HYDRA's Mole Division was responsible for administrative duties. No Mole agents were ever identified. HYDRA's Owl Division was responsible for planning duties. No Owl agents were ever identified. HYDRA's Sea Dragon Division was responsible for their naval actions. No Sea Dragon agents were ever identified. The HYDRA Undersea Assault Force (HUAF) from Strange Tales I#137 may have been members of the Sea Dragon division.